$850.00 M 1935 Service Gimnasterka Tunic of an NKVD Police Sergeant, 1936-39. 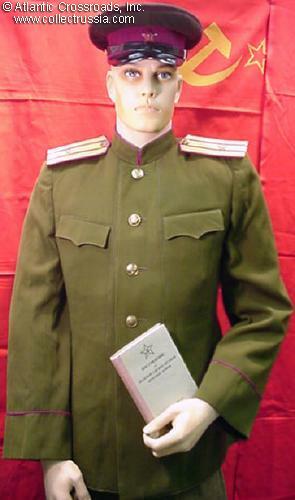 Exceptionally rare example of an original pre-WW2 uniform of the Soviet law enforcement. Medium sized (about 42R). $290.00 M 1943 gimnasterka field shirt for a woman in heavy wool gabardine. $700.00 M 1943 "Victory Parade" dress tunic of an Automobile Troops Lieutenant, circa 1943-47. Size about a US 36. A very handsome and uncommon uniform featuring silver "spools" on the cuffs, in very good to excellent condition. $495.00 M 1943 Kitel for a cadet of an Artillery Special Military High School (boarding prep school for military academy), 1943-1945. This tunic is very similar to an M 43 officer tunic with one major difference: it is made in cotton fabric rather than wool. The shoulder boards are special narrow type used only by the school cadets. In very small size appropriate for a school age boy of the period. An exceptionally rare and interesting piece! $190.00 Artillery or Tank Corps officer breeches, circa 1950s. Essentially identical to WW2 issue. $650.00 Leaf Pattern camouflage smock, unissued condition. $995.00 Military Aviator's Leather Flight Jacket, circa mid 1940s - early 50s. Clearly copied from the American A-2 but all Soviet made. Size Medium / Large. Fine quality, extremely uncommon WW2 - early Cold War piece in excellent condition.